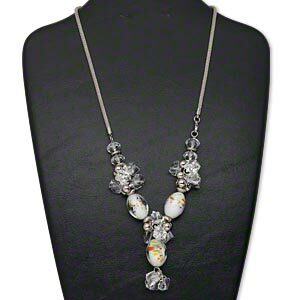 Necklace, glass / acrylic / silver-plated steel, clear, 30x30mm, 24 inches with 2-inch extender chain and lobster claw clasp. Sold individually. 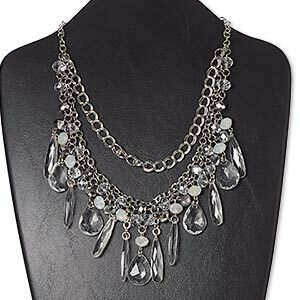 Item Number: H20-6884JD Have a question about this item? 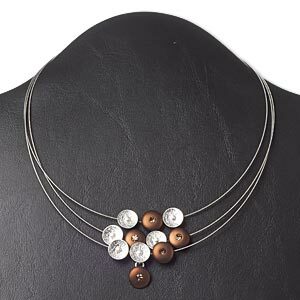 Make a fashion statement with this trendy lightweight necklace. 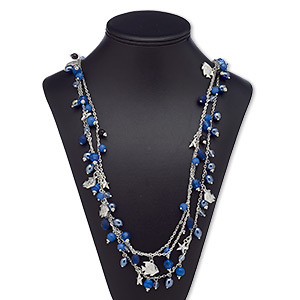 Eye-catching and perfect for counter displays--customers will love the affordable style. 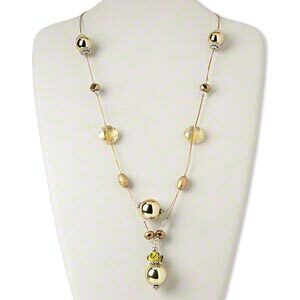 The overall necklace length measures 34 inches. Necklace, silver- and gold-coated plastic / glass / silver- and gold-finished steel / acrylic, clear / yellow / metallic gold, 20mm round, 19 inches with 2-inch extender chain and lobster claw clasp. Sold individually. Necklace, acrylic / lampworked glass / steel / silver-finished brass / silver-coated plastic, clear and mixed colors, 24x17mm oval with mixed size and shape, 2-inch dangle, 22 inches with lobster claw clasp. Sold individually. 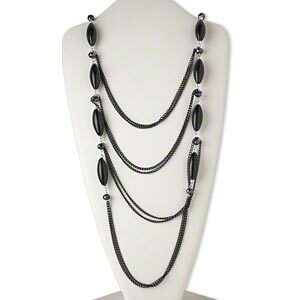 Necklace, 4-strand, gunmetal-finished steel / glass / acrylic, metallic black and silver, faceted rondelle, 24 inches with lobster claw clasp. Sold individually. 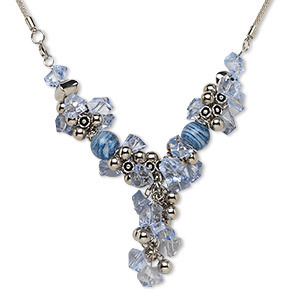 Necklace, acrylic / lampworked glass / silver-plated brass / steel / silver-coated plastic, blue, 2-inch dangle, 22 inches with lobster claw clasp. Sold individually. 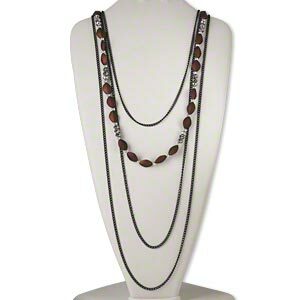 Necklace, 4-strand, steel / acrylic with rubberized coating / glass, brown / black / full silver finish, faceted rondelle and diamond, 27 inches with 2-inch extender chain and lobster claw clasp. Sold individually. 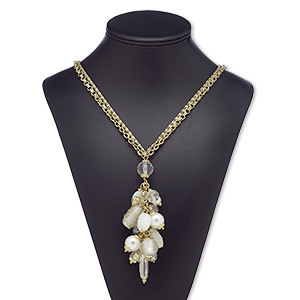 Necklace, 2-strand, glass / acrylic / acrylic pearl / gold-coated acrylic / gold-finished steel, clear and white, 5-inch dangle, 28-inch continuous loop. Sold individually.